A U.S. hospital announced that an 8-year-old American boy has become the world's youngest patient to receive a double hand transplant. Surgeons operated for 10 hours at Children's Hospital of Philadelphia to carry out an incredibly complicated operation on Zion Harvey this month, although the procedure was not announced until this week. A 40-person medical team used steel plates and screws to methodically attach the old and new bones, as well as veins. Once the blood was circulating, surgeons connected tendons, muscles and nerves. 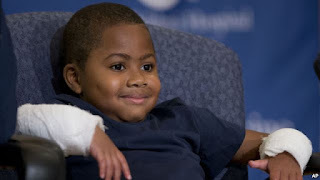 Harvey previously had both of his hands and feet amputated, plus a kidney transplant, because of a major infection. He had learned to eat, write and even play video games without his hands. He uses prosthetic legs that allow him to walk, run and jump. Doctors say Harvey will spend several weeks in physical rehabilitation at the hospital before returning to his home near Baltimore. The surgery that he received will require a lifetime of immune-suppressing drugs to ensure that his body does not reject his new hands. Several adults in the United States have received double hand or double arm transplants in recent years.